The 2019 Ram 1500 broke cover Monday and revealed a new face for the full-size pickup that pushed the hauler further into family detail. The new truck is longer—about four inches, added entirely to the cab—lower by about an inch, and wider by a half-inch. All three dimensions were stretched to better hold people, not necessarily cargo. It lacks the trademark crosshairs grille that Rams have worn since the 1960s, but adds more comforts than any of those past trucks may have dreamed. Its cabin is plush with an available 12-inch tablet-style touchscreen, more interior storage than its gas tank (nearly 38 gallons of storage inside), up to five USB ports, leather seating and real wood trim, and a mild-hybrid system for better fuel economy on most powertrains. The 2019 Ram 1500 is a better family vehicle than ever before—and it’s typical of the truck trend that may write the epitaph for the family sedan someday soon. Its march toward civility was largely telegraphed; pickups have gotten more comfortable, more spacious, more luxurious, and larger in subsequent versions of the current-generation Ram 1500. Its now-gone crosshair grille was a likely victim to the Ram’s new worldview—but it was already deleted from Ram 1500 Limited and Ram 1500 Rebel versions when they went on sale last year. The big-rig look also has been tamed. Broad shoulders have given way to slightly dropped front fenders that wrap around optional 22-inch wheels. The hood boasts a power dome, but a crease draws down from the middle of the hood, through the grille and toward the ground to help ground the big hauler’s profile. The bed rails have been lifted by 1.5 inches to offer deeper storage within the bed, but also to improve aerodynamic efficiency. It’s tall and square, but not necessarily intimidating anymore. Beneath the new Ram is a pair of familiar powertrains, with a twist. 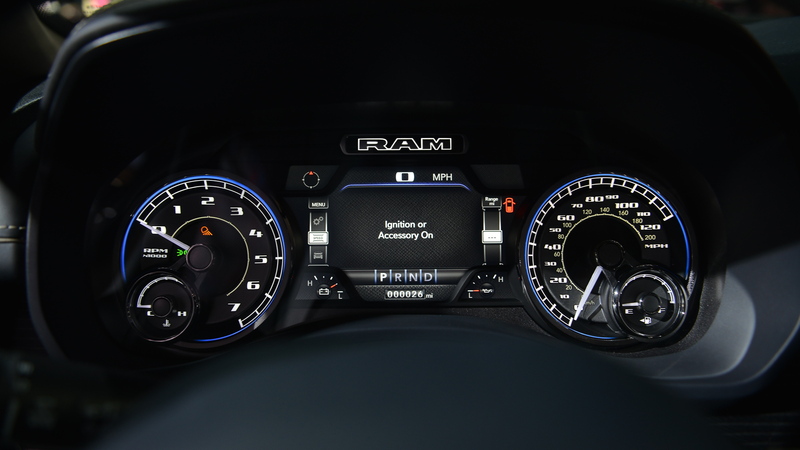 Ram’s 48-volt hybrid system—adapted from the new Wrangler—will be offered to add low-end torque and better fuel economy. Two powertrains will be offered when the truck goes on sale early this year. A 3.6-liter V-6 and 5.7-liter V-8 make a return in the 2019 Ram 1500, both paired to the hybrid system. A 3.0-liter turbodiesel will be offered for early 2019 models, according to Ram officials. In the 3.6-liter V-6, the 48-volt system will add 90 pound-feet of low-end torque, but doesn’t raise the overall output past 305 horsepower and 269 lb-ft. The 5.7-liter Hemi V-8 is the same story: 395 hp and 410 lb-ft as the outgoing model, despite the 48-volt system offering 130 lb-ft of twist. While the V-6 comes equipped with the mild-hybrid system on every version, fleet buyers and flat-earthers can opt for the hybrid system to be left off the V-8 versions. The Ram 1500 tops out in towing and payload capacity at 12,700 and 2,300 pounds, respectively. The towing figure represents a nearly 20 percent increase over the outgoing model. Ram won’t talk fuel-economy numbers, but the mild-hybrid system should almost certainly improve upon the current Ram’s 19-mpg combined rating in four-wheel-drive form. Credit the mild-hybrid system, but also credit the Ram’s diet. Engineers cut 225 pounds from the Ram’s overall weight, including 120 pounds in the frame alone. 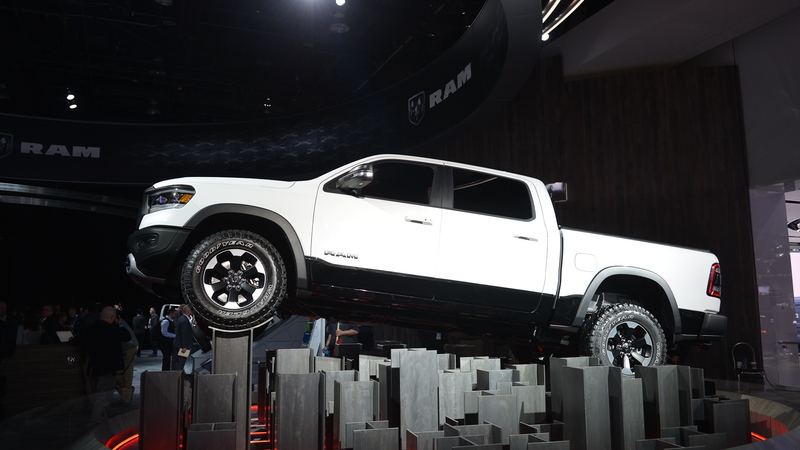 More high strength steel was used in the Ram’s ladder frame, and pass-through welds for the frame’s crossmembers should make the truck stiffer and stronger. Aluminum was used sparingly in the truck—just the hood, tailgate, and lower control arms—with steel composing most of the body panels, bed, and underpinnings. Ram will offer a four-corner air suspension on its 1500 that can raise or lower the truck 2 inches for increased ride height, or to cut a cleaner hole through the air. According to Ram, the new 1500 should be relatively aerodynamically efficient, just a .357 coefficient of drag for the full-size pickup. Inside, the Ram’s interior fittings and details shows more of its evolution as a family-friendly truck and the most popular version is proof. Ram engineers gave four-door crew cab the business end of the truck’s growth spurt. Four inches have been added to interior space, most of it in leg room for the rear passengers. When it goes on sale this spring, the Ram 1500 will be offered in Tradesman, Big Horn, Laramie, Rebel, Limited, and Longhorn trims with myriad configurations available for each. 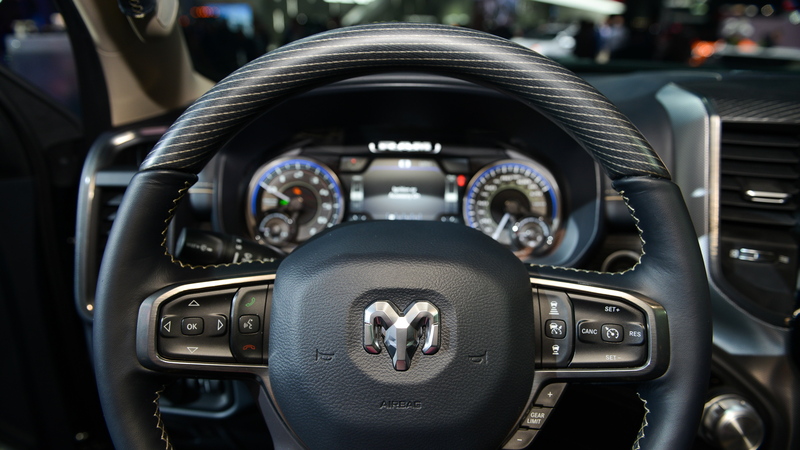 The headliner will be top Limited and Longhorn trims that boast FCA’s largest touchscreen to date: a 12-inch tablet-style screen vertically planted in the dash. The big screen is roughly two 8.4-inch Uconnect displays stacked on top of each other and information can be splayed across both screens or relegated to top or bottom depending on task. The big 12-inch tablet can recognize multi-touch gestures, but just don’t expect to pinch or swipe with leather work gloves. 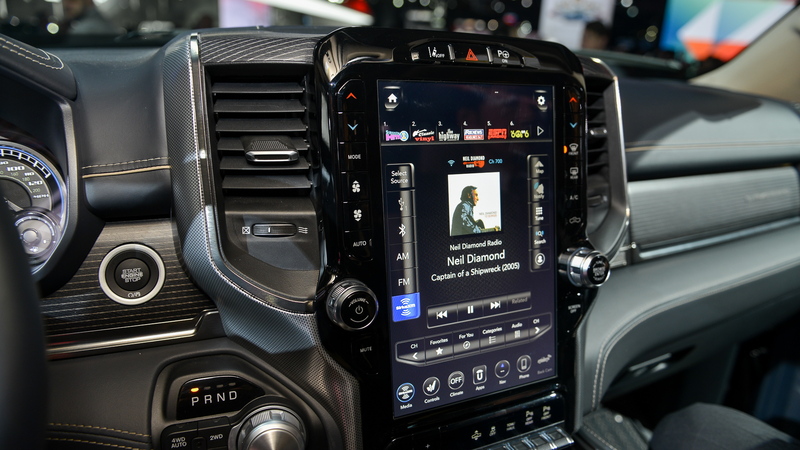 An 8.4-inch touchscreen will be equipped on most models, and a 5.0-inch display will be equipped on base trucks. For top-trim trucks, a 19-speaker Harmon Kardon sound system courses through the tony cabin, complete with a 10-inch subwoofer and stainless-steel speaker covers. Heated and cooled front and rear seats, and the rear bench, which can lift up for more interior cargo room, can recline up to 8 degrees for better long hauls. If there’s not a chauffeur-ready pickup yet, this may be it. In addition to more comfortable confines, the new Ram promises to be safer on the roads too. Ram has added small front overlap protection ahead of steel wheel blockers on driver and passenger side to better perform for the IIHS’ finicky crash test. 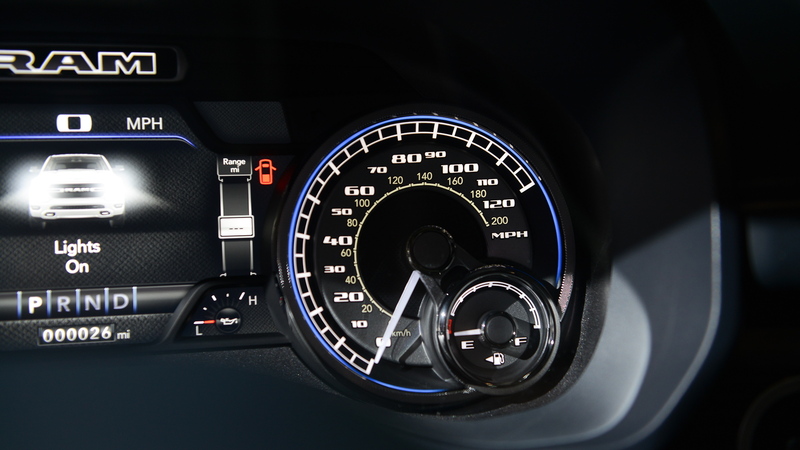 The 1500 also can be equipped with forward collision warning with automatic emergency braking, adaptive cruise control, surround view cameras, and blind spot monitors with trailer detection. The 2019 Ram 1500 will go on sale by the end of March with prices announced later this month. For more coverage of the 2018 North American International Auto Show, head over to our dedicated hub.